IBPS Clerk Mains exam has concluded and many Aspirants had appeared for the same. 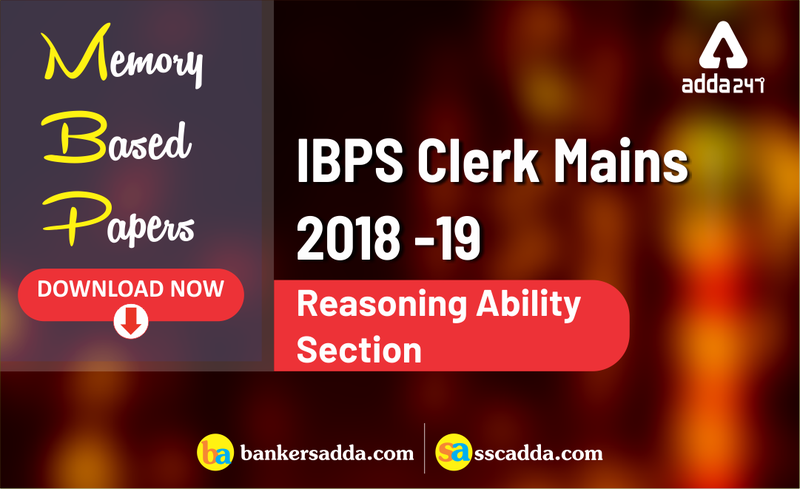 Here are some Questions of Reasoning and Computer Aptitude based in the IBPS Clerk Mains exam 2018-19. Practice these Questions as these will help you get familiar with the questions for the upcoming Exams. Twelve persons are sitting around two circular table as one is inscribed in another one. All of them are facing towards the center. A, B, C, D, E, F six persons are sitting around the inner circular table. P, Q, R, S, T, U six persons are sitting around the outer circular table. Note- The persons of outer circular table are sitting exactly behind the persons sitting around the inner circular table. D is sitting second to the right of B. P is an immediate neighbour of the one who is sitting behind D. Only one person sits between A and F. A is not an immediate neighbour of D. T is sitting behind F. R is sitting behind C. Only one person is sitting between P and Q. U is not an immediate neighbour of Q. T is not an immediate neighbour of S.
Q1. Who among the following person is sitting third to the left of A? Q2. How many persons are sitting between S and T in the outer circle? Q3. Four of the following are alike in a certain way so form a group which of the following does not belong to the group? Q4. Who among the following person is sitting immediate right of S? Q5. Who among the following person is sitting exactly behind A? A number arrangement machine when given an input line of numbers rearranges them following a particular rule. The following is an illustration of input and rearrangement. Step IV is the last step of the rearrangement. As per the rules followed in the above steps, find out in each of the following questions the appropriate steps for the given input. Q6. Which of the following is true regarding the position of 2358 in step II? For step I- All the digits of the given numbers are arranged in ascending order within the numbers. For Step II- All the numbers obtained in step I are arranged in ascending order from the left end. For Step III- First and last digits of the numbers are omitted. For step IV- The digits of the numbers obtained in step III are added. Q7. What will the addition of the numbers which is third from the right end in step II and 4th from the left end in step III? Q8. Which of the following would be the difference of the numbers which is 2nd from right end in step IV and third from left end in Step III? Q9. Which of the following element will be 2nd to the left of 4th from the right end in step III? Q10. Which of the following element will be 2nd to the left of 4th from the left end in step II? I. Some Cap are Bottle. II. Some Steel being Bottle is a possibility. III. Some Cap are not Steel. I. Some Star is not Sun. II. No Mars is Sun. III. Some Star are Venus. I. All Card are Wallet. II. Some Money can never be App. III. Some Wallet being Card is a possibility. Q14. Which of the following symbols should replace the sign ($) and (#) respectively in the given expression in order to make the expression T≥U and S>J definitely true?